Godolphin Australia has registered its first two-year-old winner for the season with Kiamichi at Rosehill. 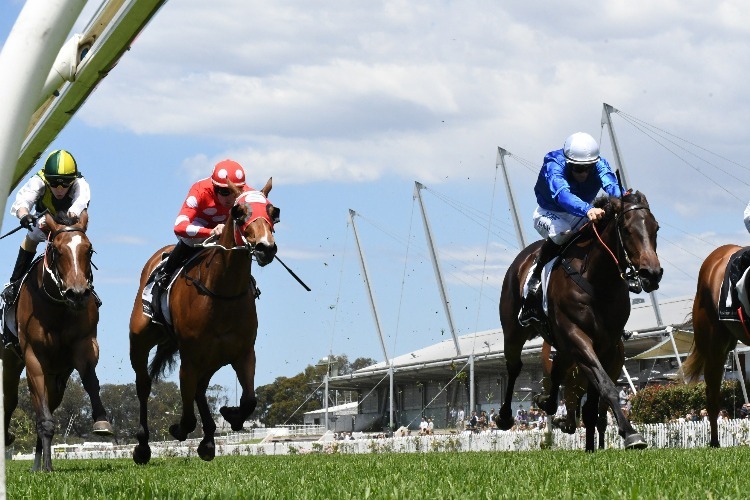 By anyone's standards, Godolphin has had a great season so far and it has continued with Kiamichi giving the Australian arm of the racing and breeding giant its first two-year-old winner for 2018-19. The filly's debut win at Rosehill on Saturday is also a first for her sire Sidestep, runner-up to Overreach in the 2013 Golden Slipper. Jay Ford took Kiamichi ($7.50) to the front in Saturday's 2YO Handicap (1200m) and she raced alongside Chia ($4.80) who took the lead at the top of the straight. But Kiamichi rose to the challenge and found another gear to win in a blanket finish with a head to Sebrakate ($2.70) and another halfhead to Oh So Hot ($10). "She has really come on since her trial," Godolphin's Darren Beadman said. "She didn't jump with blistering speed, but she gained momentum nicely. "I thought she was going to overdo it in the first 0 but once Jay was able to bring her back underneath him, she ran sweetly and went straight as a gun barrel. It was very professional." Godolphin's English trainers Saeed bin Suroor and Charlie Appleby have both won two Group One races in Melbourne this spring. The bin Suroor-trained Benbatl was successful in the Caulfield Stakes before Best Solution won the Caulfield Cup while Appleby won the Sir Rupert Clarke Stakes with Jungle Cat and the Melbourne Cup with Cross Counter. Australian trainer James Cummings won the Epsom Handicap with Hartnell and sits third on the metropolitan premiership behind Chris Waller and Darren Weir.